Take Your Picture with This Guy and Win a Free Book! Attendees of the Southern California Writer’s Conference have the chance to win a free copy of Perfect Bound: How to Navigate the Book Publishing Process Like a Pro! What to do: Take a picture of yourself with this guy ^^ and tweet it at @KPickett_Editor. What you’ll get: The first 5 people to tweet their picture will receive a free copy of Perfect Bound shipped to their house! Everyone else gets 20% off when purchased from Hop On Publishing! Learn more about Perfect Bound, including reviews, a sample chapter, and author resources, at HopOnPublishing.com. Help us reach 30 Amazon reviews by March 1 MARCH 6! So, you’ve read Perfect Bound: How to Navigate the Book Publishing Process Like a Pro. Now you have the chance to tell the world what you really think about it. And if you do it by March 1, you can save 10% on any future editing service from me. Here’s the deal. I want to help authors all across the country who need to better understand what it takes to publish a quality and highly marketable book. The problem is, to reach the most people, we need lots of great reviews on Amazon. Why? Because many book marketing sites and local book festivals and national and international writing conferences decide whom to feature based in part on the number and quality of book reviews on Amazon. That means, to take advantage of these opportunities, we need your reviews! As of February 4, Perfect Bound has 10 reviews on Amazon. But I think we can do better. I think we can make it to 30, and I think we can do it before March 1.Will you help us?Remember, all you have to do is write and publish your honest review on Amazon.com before March 1. You will automatically receive 10% off your next editing service from me. If you don’t have Perfect Bound yet, you can get the e-book for just $2.99 anywhere you buy books. Buy your copy now! P.S. Have feedback you don’t want to post in public? Send your comments directly to me. I want to hear from you! Perfect Bound for $0.99? It Must Be Christmas! For the next 12 days, you can get Perfect Bound: How to Navigate the Book Publishing Process Like a Pro for 99 cents! From now until January 2, e-books are just 99 cents through our website. At that price you could buy a copy for everyone on your shopping list and keep another for yourself. But here’s a secret: You don’t have to do that. Perfect Bound is shareable! Although many e-books are DRM protected, we at Hop On think that’s silly. You can share a print book, so why not an e-book? That’s why we chose not to protect Perfect Bound. So share and share alike! Now isn’t that the spirit of the holidays? Sale ends January 2 and it’s only good through our website, so don’t delay. Get your e-book for 99 cents today! Book-Publishing Talk and Signing This Saturday! Marylanders, take note: If you missed my book launch event earlier this month, you have another chance! And this time, there’s a freebie involved. This Saturday, September 27, I will be at Novel Books (23330 Frederick Road, Clarksburg, MD 20871) speaking about Perfect Bound: How to Navigate the Book Publishing Process Like a Pro and the state of book publishing today. Stop by and you could win a seat at my November workshop for you or a friend. The event starts at 10 a.m. All are welcome. I hope to see you there! THANK YOU to everyone who made the launch of Perfect Bound: How to Navigate the Book Publishing Process Like a Pro such a success! Although not everything went according to plan, we had little to complain about. The big bang we were hoping to make on September 1 was more like the sound of a pop gun, but we made up for it on the 2nd. The publication of two meaty articles (on the websites Live Write Thrive and Publishing Perspectives) garnered us some much-appreciated attention, and at 11:30 on Wednesday night, we discovered we had hit the Amazon bestseller list for Editing Reference! Two other articles that were expected to publish by then had not yet surfaced, and it turned out there was some miscommunication. The Writer Beware article published Friday instead of Tuesday, and the excerpt on Jane Friedman’s blog pubbed the following Monday instead of Wednesday, but publish they did, and we again saw immediate returns. For those writers who have been following along, blog tours really are worth the effort. Another highlight came Wednesday when veteran editor Katharine O’Moore-Klopf, who has much more experience than I, contacted me about the book. 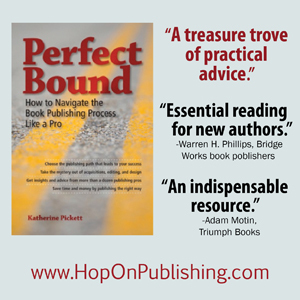 After reading the sample chapter available on the Hop On website, she bought the book and wrote an impromptu blog post recommending Perfect Bound as a continuing-ed book for editors. We were thrilled! The launch parties at Kensington Row Bookshop in Kensington, Maryland, and Left Bank Books in St. Louis, Missouri, were great fun and also well worth the investment. On both nights we surpassed our modest sales goals and, more important, were able to celebrate with friends, colleagues, and newcomers alike. I was even able to meet my designer, Sue Hartman, for the first time. We had worked together off and on for 15 years and never met until now! Those who attended can attest that my daughter stole the show. She was a trooper, staying up well past her bedtime to help her parents celebrate and enjoy the moment. I loved getting to share the night with her. There is much more to come from Hop On Publishing. A webinar is scheduled for next week, another talk and signing on the 27th at Novel Books, and a trip to Rehoboth Beach for a workshop October 4. This week we are catching our breath and soaking in what we have achieved. Nothing goes as planned. Find out what changed and get the live links to all the happenings from last week and this one. Friday Night: Launch Party at Kensington Row Bookshop, 3786 Howard Ave., Kensington, MD 20895, 6 to 9 p.m. Come out for a night of food, fun, and books! All are welcome. Excerpt from Chapter 2 of Perfect Bound, “To Sign or Not to Sign with an Agent,” published by Vonnie Winslow Crist. Thursday (9/11): We travel to St. Louis for the Midwest book launch at Left Bank Books, 399 N. Euclid Ave., St. Louis, MO 63108, 7 to 10 p.m. Again, all are welcome. At the end of the month, Saturday, September 27, I will be having a book signing at Novel Books in Clarksburg, MD. Attendees can enter to win 25% off my next workshop. This has been an amazing journey. We at Hop On send a heartfelt “Thank You!” to everyone who has helped us, especially the publishing professionals and authors who were interviewed for the book, as well as our family, friends, and colleagues. The book wouldn’t be what it is without you! Also available through iBooks, Gardners, Novel Books, and other sites around the web! In December 2012, when I was six months’ pregnant, I began writing a book. In a rare aligning of the stars, three of my scheduled editing projects were pushed back a month, and I found myself with some time on my hands. I had been kicking around the idea of writing a book to help new authors understand the book editing and publishing process so that they could avoid costly mistakes, and the opportunity to actually follow through on that had just presented itself. The idea was that the book would benefit my clients and other writers while at the same time helping me to grow my established editing company. I had given some well-attended workshops on the same topic, and I knew that there were new and aspiring authors who needed this information. I set to work pouring all of my ideas onto paper. I knew the baby was coming soon enough, and I think being pregnant made me all the more determined. I completed my first draft in a little over three months; it took another 12 to finish my revisions. After some exploration of my options, I concluded that self-publishing was the way to go for this niche project, and to increase the book’s chances of success, my husband and I decided to start a publishing company. In March 2014, with our infant daughter at the babysitter’s, my husband and I drove to the offices of the Maryland Department of Assessments and Taxation in Baltimore and officially formed Hop On Publishing LLC. This was a definite complication that we did not have to undertake, but given the glut of self-published books vying for attention, we wanted to let our readers and reviewers know that we were serious about making a high-quality book. Taking this extra step to demonstrate our professionalism was worth the additional work and expense. Our first book, Perfect Bound: How to Navigate the Book Publishing Process Like a Pro, releases September 1. The book has received great advance reviews, we have a number of promotional events lined up, and we are excited about all that is possible. That’s the “preneur” part. The “mom” part wasn’t so easy. Although I was able to get a first draft completed before the baby was born, revisions were squeezed in during nap time and after the little one went to bed. Middle-of-the-night feedings were brainstorming sessions for chapter titles and cover ideas. I relied heavily on my husband to keep the house running when I had a full day of work and a full night of rewrites. Adding writing to my busy editing schedule set my work-life balance off-kilter, and I struggled with how much time this project was keeping me away from my new baby. But when I think about the story of how this book and this company came to fruition, I also think of how proud my little girl will be when she realizes what I have accomplished. She might be 25 years old before she understands what it takes to write and publish a book, not to mention the added challenges of doing so with an infant in the house, but that’s OK with me. What may be most notable is that I almost certainly would not have embarked on this adventure if I had waited until my daughter was born. Rather, I feel I hit the sweet spot. I built up just enough momentum while I was pregnant to keep me writing through the baby’s first several months of life, and at not quite 18 months, she is much more self-sufficient now, allowing us to charge full-tilt into marketing mode. As we consider the possibility of growing our family, my husband and I have joked about what my next book would be to go along with a new baby. Just the thought of it makes me sweat. Although I can’t say I would ever again write and publish a book with a newborn at home, I can say I wouldn’t have done it differently this time around. For many writers, the design part of book publishing is mystifying. This excerpt from the chapter “Making It Look Good: Design and Layout” sheds some light on what to expect and what is expected of you when working with a designer. Professional designers offer an expertise that most literary types don’t have: they know what it takes to make a book visually appeal­ing. That includes a wide range of aspects, from choosing appro­priate artwork (photo or illustration), colors, and fonts for your subject area or genre to knowing the best spacing to use on chapter- opening pages and where to place the page numbers and running heads. Further, your designer will be able to locate the correct art­work and, if you are self-publishing, may be able to help you secure licenses for using the art. For the traditionally published author, the publishing house most often takes care of licensing. You can also expect your designer to understand good lay­out principles. That means knowing how to “twin” pages—that is, make sure that the tops and bottoms of facing pages align—and fix bad breaks. It also includes making adjustments to spacing, hyphenation, and justification to ensure that the last page of a chapter has enough lines of text (at least six lines is optimal; four is passable) and that there are no blank right-hand pages. The design sample shows you how the interior of your book will look after layout. When it comes to choosing the design for your book, your designer will do his or her best to represent your ideas. It is helpful if you have specific ideas to share, rather than vague notions, but also be sure to listen to your designer if he or she is gently nudging you in a certain direction. The designer may have reasons for his or her ideas that you aren’t aware of, and, in my experience, if you don’t ask your designer’s opinion, you won’t get it. The designer will give you what you asked for, even if it isn’t his or her first choice. If you are self-publishing, you will work directly with your designer to come up with design ideas that are appropriate for your book. Your designer will listen to your ideas and attempt to convey your vision for the book through the cover and interior designs. Although you may use a different interior designer and cover designer, or possibly a template interior and a custom cover design from your designer, you will achieve a more seamless look if the same person does both designs. Template interiors work best with all-text books such as novels, where it is unlikely that a lot of adjustments will need to be made. Self-publishing advocate Joel Friedlander sells templates for Microsoft Word through his web­site (www.thebookdesigner.com), while some designers offer tem­plates at a savings compared to a custom design. Those working with traditional publishing houses should recall that although they have input on the cover and interior designs for their books, they very rarely get final approval. That means you can give your opinion, but you are not likely to get everything you want. As mentioned, authors who have signed with a traditional publish­ing house will have little direct contact with the designer. There­fore, designers do not have many expectations from these authors specifically. Nevertheless, for all authors, a good working relation­ship with a designer requires a collaborative mind-set. Designers working with self-publishers expect their clients to have an opinion about what the design should be. If you have researched the competition ahead of time, you are in great shape, as you probably already have thoughts on what you like and what you don’t. Designers are the creative minds, however, and do best with a little freedom. That is to say, if you let them, good designers will take your ideas, add a few of their own, and bring you two or three design options that look great and fit your needs. If you have not formulated your tho ughts on how your book should look—for example, you have not researched the competition and therefore do not know what the conventions are for your genre—your designer will have to come up with something all on his or her own. This may work out great, but it also may happen that although you did not know how to verbalize what you like, you did indeed have an opinion, and the designer has missed the mark. This will result in many back-and-forths that could have been eliminated if you had done some research beforehand. Conversely, if you know precisely what you want, down to the last detail, you leave your designer with no room to be creative. You may get exactly what you want, but you lose the advantage of having hired an expert, and what you want may not be what is best for the marketability of the book. Looking through other books to find the designs you like may take a bit of time, but it’s also a lot of fun. It means your idea for a book is getting closer to reality. When it is time for layout, be organized. Your manuscript file should be clean and ready to go, and your artwork and captions should be numbered and organized. A “clean” manuscript is free of extra spaces between words or sentences, free of extra paragraph breaks, and free of extra tabs. The entire file is double-spaced and in one standard font, such as Times New Roman, Arial, or Courier New. All text is “normal”; there are no random style sheets applied via Microsoft Word. And any queries from the copyeditor have been removed, with all tracked changes accepted. If you supply your manuscript this way, the designer can focus on more import­ant issues and you will receive your page proofs that much faster.